Gilbert’s has some of the nicest folks you’ll ever meet greeting you as soon as you walk in. It makes you feel like you’re home. There’s an old diner feel to the place and I like it. The menu has a variety of dishes but I’m obviously here to try their burger. Which burger to have? It made sense to have the standard 8oz. Certified Angus Beef Burger. I figured Cheese and Bacon were a necessary evil, so Cheddar Cheese and Bacon it is. It was recently crowned Best Burger by Sun Sentinel’s Online Reader’s Poll. The Burger was good, it was a solid Burger. It was thick and if there’s one thing I took away from eating the burger was how juicy it was. The best way to describe the flavor is to say it’s a very beefy tasting burger, almost steak-like. Also, I really dug the bacon. And the fries? Dude. I loved them. Gilbert’s need to make a Cheese Fries appetizer with some of that amazing Bacon on it. I’ll be back. There are a few food concoctions on the menu I’d like to try like the Goat Cheese Burger with Caramelized Onions or the Bacon Cheese Fries, wait….that’s not on the menu. Well, at least not yet. After multiple visits, it is imperative that I let you know that you MUST have the Havarti Burger (8 oz. Burger topped with Bacon & Havarti Cheese between two toasted English Muffins with Garlic Butter). That is all! 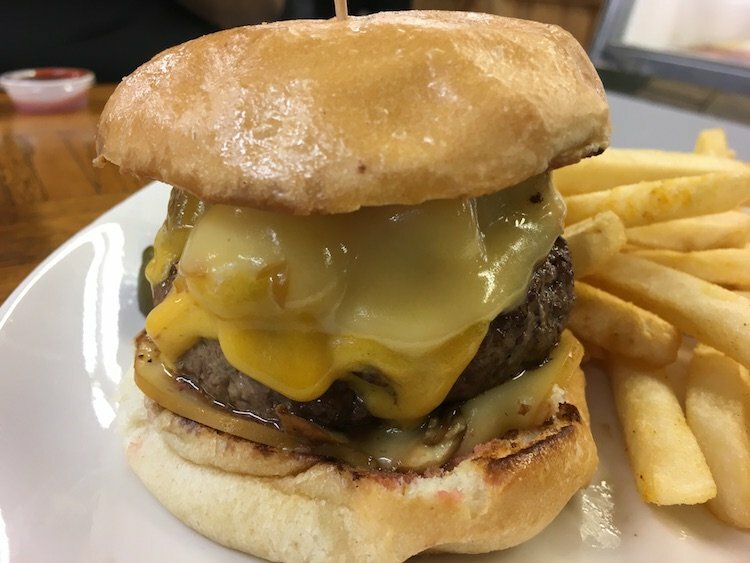 Gilbert's was selected as Best Burger in Broward by readers of the Sun-Sentinel, not New Times. New Times, for 2010, picked Charm City. I tried that burger last year and all I was thinking while eating it was why I didn't go across the parking lot to Five Guys. Who is going there when you can get a better burger for half the price at Five?? @Whack-a-mole Thanks. It's been corrected. Thank you so much for coming in and checking out our burger!! We are so glad you enjoyed it and look forward to having you back again. We can pretty much make anything you request and while cheesy fries with bacon may not be on the menu, please let us know it is something you would like when you come in and we would be happy to make it. Also, we are constantly trying new burger creations, any suggestions or inspirations are always welcomed! My neighbor told me about Gilberts and I tried it last night. First off…service is excellent. Nice setting. Burger was very good. Love the portion size of the slaw too. Bun was nice and fresh…I did think it was a bit pricey. I had a mushroom/onion/cheeseburger and a small fountain drink and it was $13…then a tip for the wait staff…good burger though. Not all that many years ago, McDonalds was selected “Best Burger” by the readers of the Sun Sentinel. Not to judge Gilbert’s but the Sun Sentinel is the last place I’d go for food recommendations. I could say a lot of things that I like about Gilbert’s 17t Street Grill. But seriously, the Brownie Burger (and all of their desserts) needs some recognition…!! !